I could see the buildings from some distance. Not only are they imposing structures in itself but they sit on a natural mound about ten meters above the River Spey. 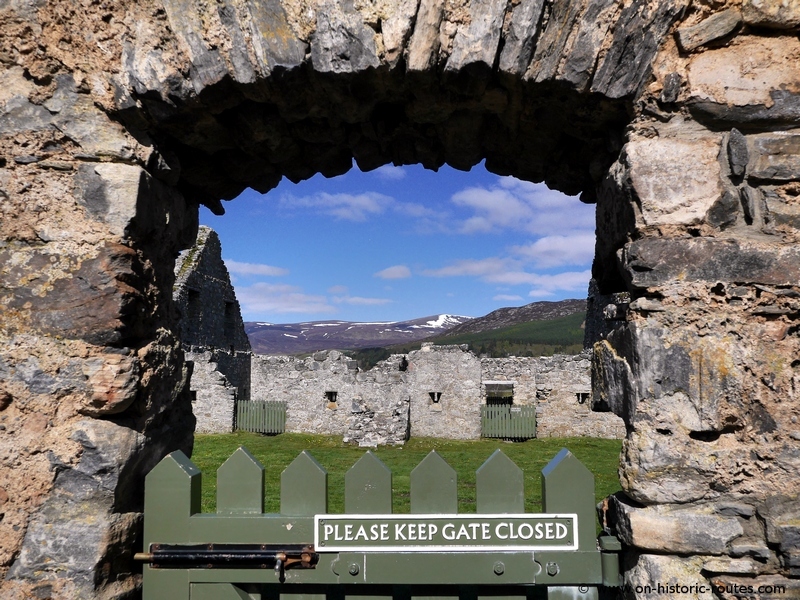 Ruthven Barracks were on my must-see list for the TGO Challenge. It was a warm, sunny morning and I had bought sandwiches for a second breakfast. Ruthven Barracks were a perfect picnic spot that day before heading for Glen Feshie. Yesterday’s long, tiring walk on tarmac was already forgotten. 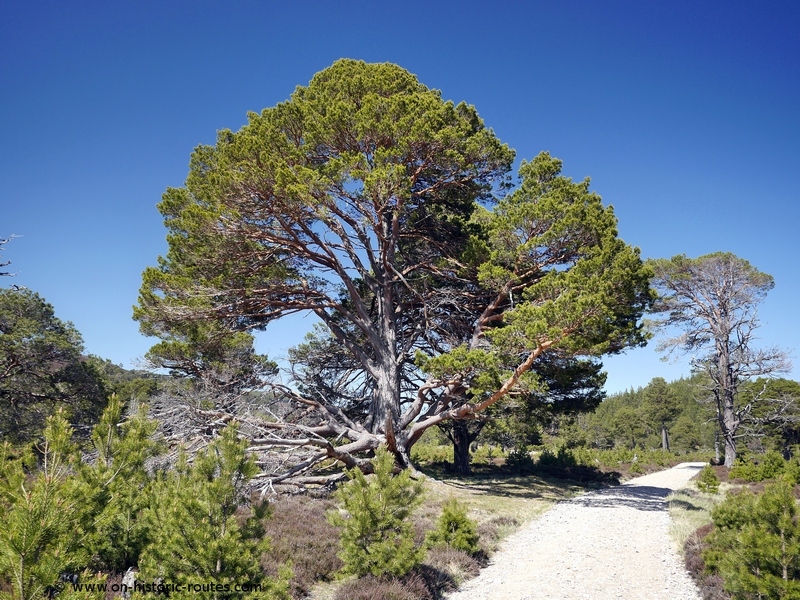 Walking on historic paths through the Highlands, there is hardly a way around the old military roads. Following the Jacobite uprisings in the 18th century, the British army built a network of roads through the Highlands to pacify the area (e.g. facilitate movement of occupational troops). The effort was led by General Wade after whom the roads are still named. Forts were also built to house the troops. 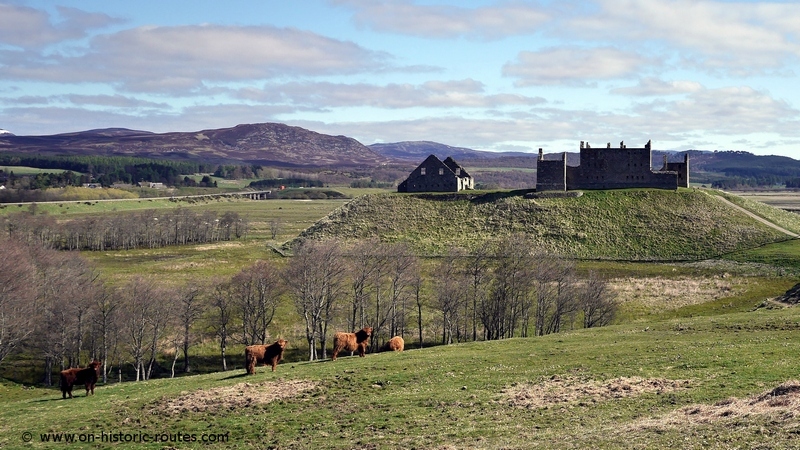 Fort William and Fort Augustus were location of such forts as well as the Ruthven Barracks near Kingussie. While the barracks are in ruins, the roads are still being used: The road through the Great Glen from Fort William to Inverness as well as the A9 from Perth to Inverness follow the routes of Wade’s original roads. Other sections however are less used. My route from Fort Augustus to Kingussie and Ruthven Barracks was following Wade’s old military road across the Corrieyairack Pass. I was curious how much of the old road can be found today. The old road starts about one kilometer out of Fort Augustus. It looked promising: A gate and a small path next to an old stone wall leading up the hill. However, about ten meters next to the gate starts the access road for construction of the power line across the Corrieyairack. The old path – protected as a monument – and the new road ran next to each other for some time until I was in the middle of a construction site. I missed a turn and had to retrace for a bit until I was on the old road again. It now led away from the pylons and became more quiet as I walked up the hills. There were streams to cross, old bridges across bigger rivers and a track that made its turns up the hillside towards the pass. It was pleasant walking although a bit of a climb to reach the pass at 770 m. The descent towards Melgarve was steeper and had some snow patches to cross. There were more streams to ford and old bridges to find before the track turned into a tarmac road at Melgarve Bothy. The route has been rewarding in terms of traces of Wade’s building activities so far. 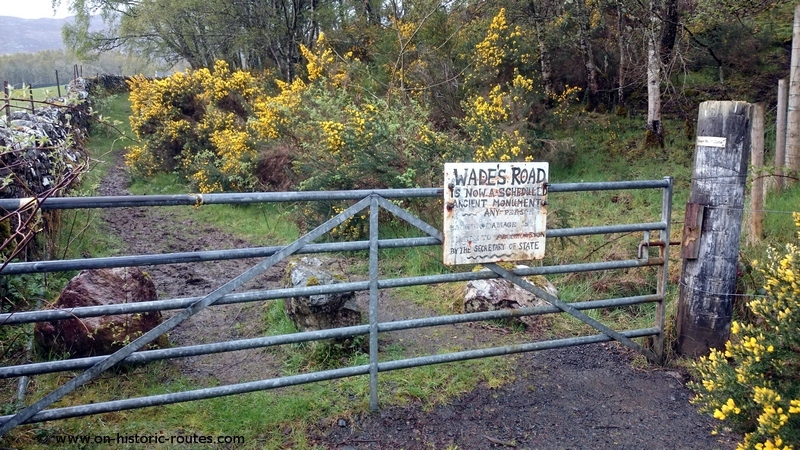 It is good to see that Wade’s road is protected and maintained in that state despite the need to build modern infrastructure. 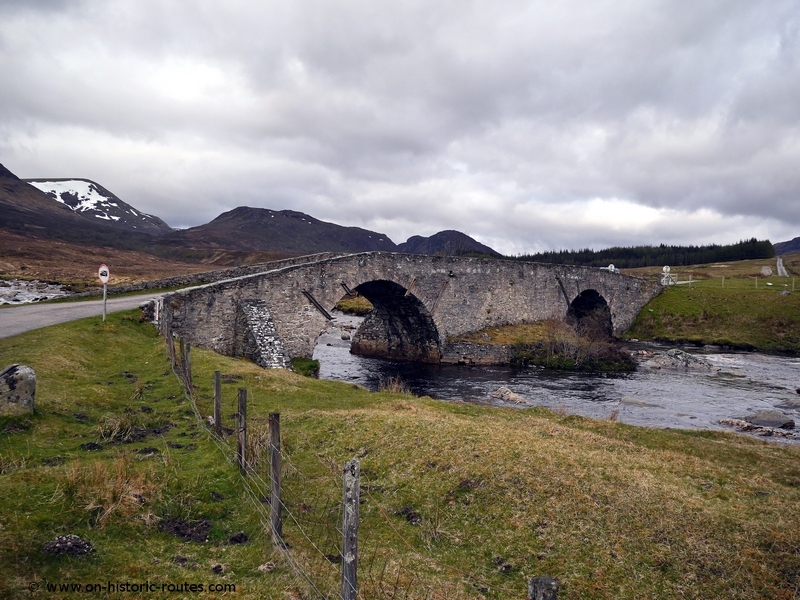 That early effort of road building nearly 300 years ago was important to the history of the Highlands and much of it is lost under modern roads. While the weather improved during the day, the wind got quite strong in the afternoon. 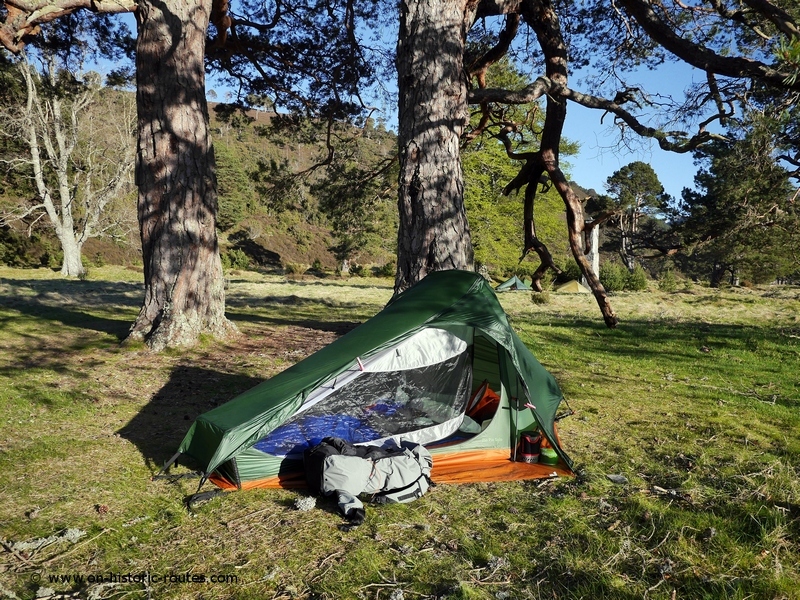 I didn’t fully trust my tent yet and pitched in a sheltered yet boggy place short of Garva Bridge. When I passed the bridge the next morning, a large group of challengers was just about to get going. The tarmac road to Laggan and Newtonmore was somewhat uneventful and tiring. I was happy to stop at the campsite in Newtonmore, and enjoy a sunny afternoon in town. My motivation was high for the next day and it did not take long for my picnic break at the Ruthven Barracks. 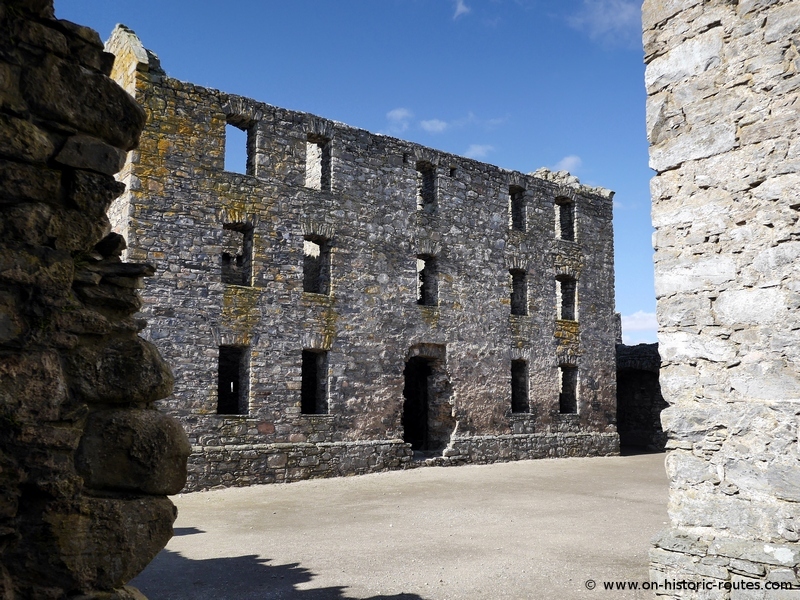 The weather had improved and I enjoyed exploring the ruins on a perfectly sunny morning. The barracks buildings were completed in 1721 to house 120 soldiers. Stables were added later to allow for dragoon patrols along the military roads. The two barrack buildings are in good condition just as the surrounding wall and stables. There are interpretive plagues explaining the individual rooms. The whole site is in a good condition and very much worth a visit. Ruthven Barracks were only used for 25 years. During the 1745 Jacobite uprising the barracks fell to the rebels and burned down following the defeat at the Battle of Culloden. The roads they were built to protect definitely enjoyed more success. From Ruthven Barracks I had planned to continue to Rothiemurchus and then cross the Cairngorms through Lairig Ghru. The generally cold conditions (much snow left) and the mid-term forecast made me decide in favor of my foul weather route, though. It would be Glen Feshie then. Many challengers love that route and for good reasons. The views of the river, the old pine trees and the mountains were just beautiful. 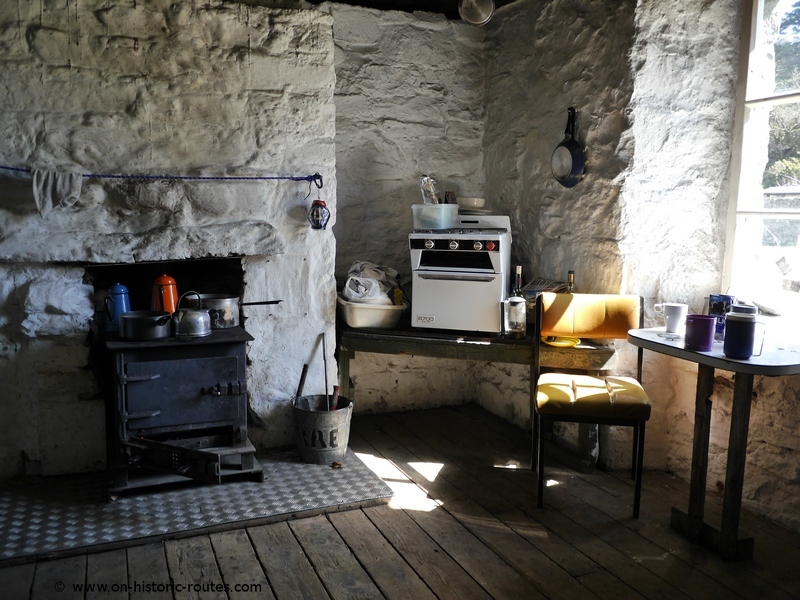 I could smell the fire at Ruigh Aiteachain bothy maybe 20 minutes before I got there. A group of hill-walkers who came the other way had told me that a cup of tea was waiting there for challengers. It was still early in the afternoon but it did not take long to decide to stay for the night. My pitch under an old pine tree turned out to be the best camp spot on the challenge. The night was clear and very cold and the walk up Glen Feshie and through the heather the next morning very rewarding. This was not just a foul weather alternative but a very nice walk. 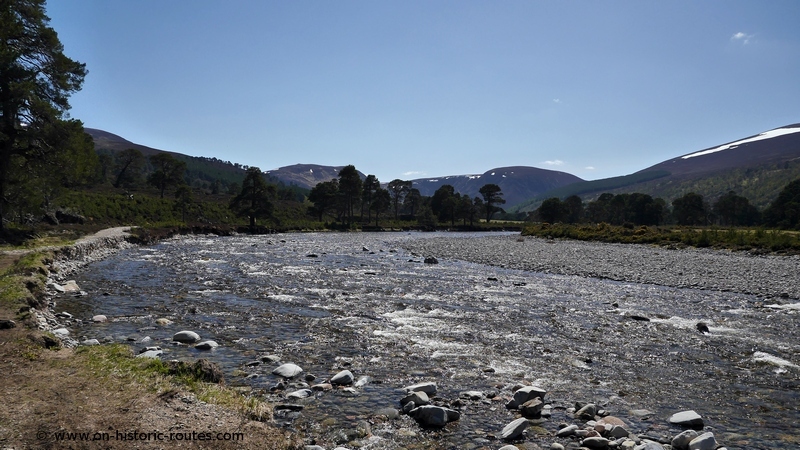 – The road down River Dee from the East. The Heritage Paths website has good information about these routes. 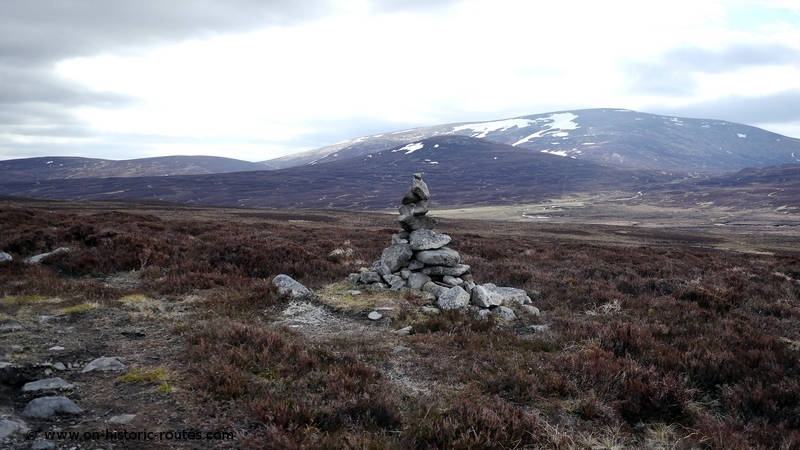 The contrast between the old drove road through Glen Feshie and Wade’s road was obvious on several layers. Walking on just a single trail across the moor in an unspoiled glen makes the experience different from having it to share with power lines and construction vehicles. In my opinion these remote places need to be protected because they are rare enough in today’s world. Finding the right balance with justified demands for modern infrastructure will be difficult though. A different perspective is to look at both routes in terms of 18th century infrastructure in the Highlands. 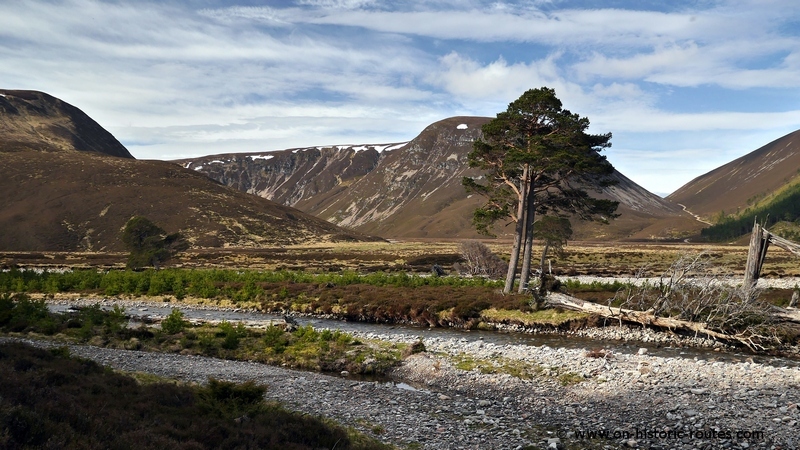 At the time of Wade’s roads, the route through Glen Feshie was used as a drove road. The conditions might not have been much different from today’s track. There were no bridges and no paved road through the moor. Being a low level route through the high mountains of the Grampians it was probably a somewhat typical Highland road of that time. The new paved roads that were built by the army at that time, were a completely different infrastructure. Wide paved road, bridges across rivers and rather gentle slopes made travel much easier and suitable for wagons. There is a certain resemblance to today’s construction activities in the Highlands. I wonder how people 300 years ago viewed Wade’s new roads and the new accessibility of the hills. 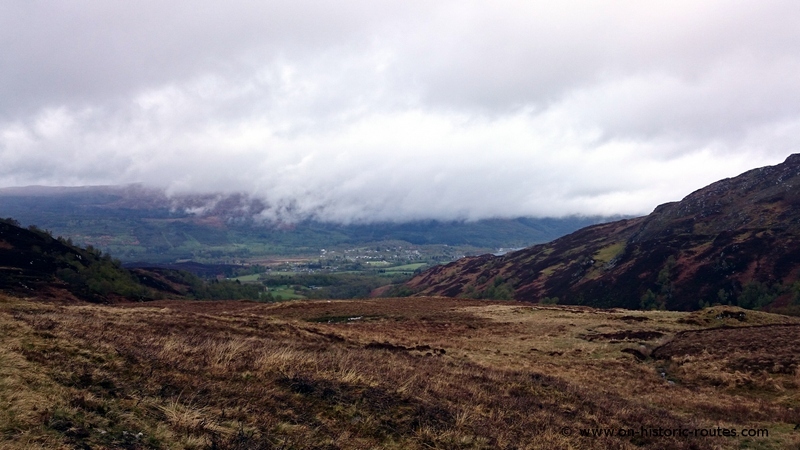 Please also read part 3 of my TGO Challenge 2015 – Firmonth Road.